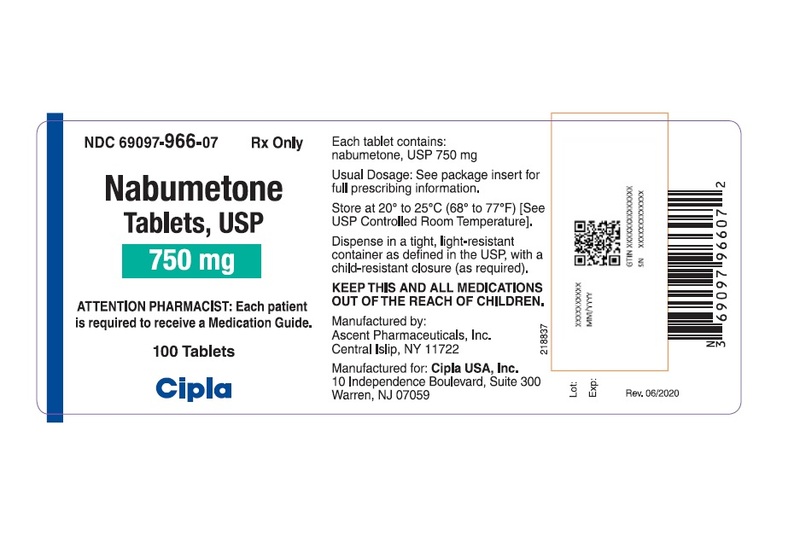 Proprietary Name: Nabumetone What is the Proprietary Name? Non-Proprietary Name: Nabumetone What is the Non-Proprietary Name? 69097 - Cipla Usa Inc.
Nabumetone with NDC 69097-966 is a a human prescription drug product labeled by Cipla Usa Inc.. The generic name of Nabumetone is nabumetone. The product's dosage form is tablet, film coated and is administered via oral form. Labeler Name: Cipla Usa Inc.
FDA Application Number: ANDA078671 What is the FDA Application Number? Nabumetone, USP is a naphthylalkanone designated chemically as 4-(6-methoxy-2- naphthalenyl)-2-butanone. Nabumetone is a white to off-white crystalline substance. It is nonacidic and practically insoluble in water, but soluble in alcohol and most organic solvents. It has an n-octanol:phosphate buffer partition coefficient of 2400 at pH 7.4.Each tablet, for oral administration contains either 500 mg or 750 mg of nabumetone. In addition, each tablet contains the following inactive ingredients: microcrystalline cellulose, sodium starch glycolate, hydroxy propyl methyl cellulose, sodium lauryl sulphate, colloidal silicon dioxide and magnesium stearate. The 500 mg tablets also contain opadry white (Titanium dioxide, Hypromellose 3cP, Hypromellose 6cP, Macrogol and Polysorbate 80) and the 750 mg tablets contain opadry beige (Hypromellose 6cP, titanium dioxide, iron oxide yellow, iron oxide red and Macrogol). Nabumetone is a non-steroidal anti-inflammatory drug (NSAID) that exhibits anti-inflammatory, analgesic, and antipyretic properties in pharmacologic studies. As with other non-steroidal anti-inflammatory agents, its mode of action is not known; however, the ability to inhibit prostaglandin synthesis may be involved in the anti-inflammatory effect.The parent compound is a prodrug, which undergoes hepatic biotransformation to the active component, 6-methoxy-2-naphthylacetic acid (6MNA) that is a potent inhibitor of prostaglandin synthesis.6-methoxy-2-naphthylacetic acid (6MNA)It is acidic and has an n-octanol: phosphate buffer partition coefficient of 0.5 at pH 7.4. In 1-week, repeat-dose studies in healthy volunteers, 1,000 mg of nabumetone daily had little effect on collagen-induced platelet aggregation and no effect on bleeding time. In comparison, naproxen 500 mg daily suppressed collagen-induced platelet aggregation and significantly increased bleeding time. The use of nabumetone in relieving the signs and symptoms of rheumatoid arthritis (RA) was assessed in double-blind, randomized, controlled trials in which 770 patients were treated for 3 weeks to 6 months. Nabumetone, in a dose of 1,000 mg/day administered at night, was comparable to naproxen 500 mg/day and to aspirin 3,600 mg/day. In controlled clinical trials of rheumatoid arthritis patients, nabumetone has been used in combination with gold, d-penicillamine, and corticosteroids.Patient Exposure in Clinical Trials of Osteoarthritis and Rheumatoid Arthritis:In clinical trials with osteoarthritis and rheumatoid arthritis patients, most patients responded to nabumetone in doses of 1,000 mg/day administered nightly; total daily dosages up to 2,000 mg were used. In open-labeled studies, 1,490 patients were permitted dosage increases and were followed for approximately 1 year (mode). Twenty percent of patients (n = 294) were withdrawn for lack of effectiveness during the first year of these open-labeled studies. The following table provides patient exposure to doses used in the US clinical trials:Table 2. Clinical Double-Blinded and Open-Labeled Trials of nabumetone in Osteoarthritis and Rheumatoid ArthritisDose ofNabumetoneNumber of PatientsMean/Mode Durationof Treatment (yr)OARAOARA 500 mg 17 6 0.4/– 0.2/– 1,000 mg 917 701 1.2/1 1.4/1 1,500 mg 645 224 2.3/1 1.7/1 2,000 mg 15 100 0.6/1 1.3/1As with other NSAIDs, the lowest dose should be sought for each patient. Patients weighing under 50 kg may be less likely to require dosages beyond 1,000 mg; therefore, after observing the response to initial therapy, the dose should be adjusted to meet individual patients’ requirements. Carefully consider the potential benefits and risks of nabumetone tablets, USP and other treatment options before deciding to use nabumetone tablets. Use the lowest effective dose for the shortest duration consistent with individual patient treatment goals (see WARNINGS).Nabumetone tablets, USP are indicated for relief of signs and symptoms of osteoarthritis and rheumatoid arthritis. and PRECAUTIONS, General, Preexisting Asthma).Nabumetone tablets are contraindicated in the setting of coronary artery bypass graft (CABG) surgery (see WARNINGS). CARDIOVASCULAR EFFECTSCardiovascular Thrombotic EventsClinical trials of several COX-2 selective and nonselective NSAIDs of up to three years duration have shown an increased risk of serious cardiovascular (CV) thrombotic events, including myocardial infarction (MI) and stroke, which can be fatal. Based on available data, it is unclear that the risk for CV thrombotic events is similar for all NSAIDs. The relative increase in serious CV thrombotic events over baseline conferred by NSAID use appears to be similar in those with and without known CV disease or risk factors for CV disease. However, patients with known CV disease or risk factors had a higher absolute incidence of excess serious CV thrombotic events, due to their increased baseline rate. Some observational studies found that this increased risk of serious CV thrombotic events began as early as the first weeks of treatment. The increase in CV thrombotic risk has been observed most consistently at higher doses.To minimize the potential risk for an adverse CV event in NSAID-treated patients, use the lowest effective dose for the shortest duration possible. Physicians and patients should remain alert for the development of such events, throughout the entire treatment course, even in the absence of previous CV symptoms. Patients should be informed about the symptoms of serious CV events and the steps to take if they occur.There is no consistent evidence that concurrent use of aspirin mitigates the increased risk of serious CV thrombotic events associated with NSAID use. The concurrent use of aspirin and an NSAID, such as Nabumetone, increases the risk of serious gastrointestinal (GI) events [see WARNINGS].Status Post Coronary Artery Bypass Graft (CABG) SurgeryTwo large, controlled clinical trials of a COX-2 selective NSAID for the treatment of pain in the first 10 to 14 days following CABG surgery found an increased incidence of myocardial infarction and stroke. NSAIDs are contraindicated in the setting of CABG [see Contraindications].Post-MI PatientsObservational studies conducted in the Danish National Registry have demonstrated that patients treated with NSAIDs in the post-MI period were at increased risk of reinfarction, CV-related death, and all-cause mortality beginning in the first week of treatment. In this same cohort, the incidence of death in the first year post MI was 20 per 100 person years in NSAID-treated patients compared to 12 per 100 person years in non-NSAID exposed patients. Although the absolute rate of death declined somewhat after the first year post-MI, the increased relative risk of death in NSAID users persisted over at least the next four years of follow-up.Avoid the use of nabumetone tablets in patients with a recent MI unless the benefits are expected to outweigh the risk of recurrent CV thrombotic events. If nabumetone tablets are used in patients with a recent MI, monitor patients for signs of cardiac ischemia.Hypertension: NSAIDs, including nabumetone tablets, can lead to onset of new hypertension or worsening of preexisting hypertension, either of which may contribute to the increased incidence of CV events. Patients taking thiazides or loop diuretics may have impaired response to these therapies when taking NSAIDs. NSAIDs, including nabumetone tablets, should be used with caution in patients with hypertension. Blood pressure (BP) should be monitored closely during the initiation of NSAID treatment and throughout the course of therapy.Heart Failure and EdemaThe Coxib and traditional NSAID Trialists’ Collaboration meta-analysis of randomized controlled trials demonstrated an approximately two-fold increase in hospitalizations for heart failure in COX-2 selective-treated patients and nonselective NSAID-treated patients compared to placebo-treated patients. In a Danish National Registry study of patients with heart failure, NSAID use increased the risk of MI, hospitalization for heart failure, and death.Additionally, fluid retention and edema have been observed in some patients treated with NSAIDs. 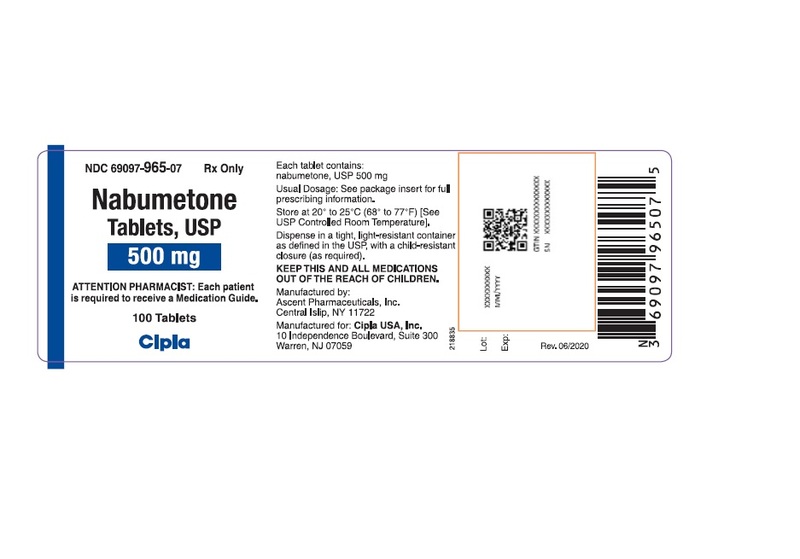 Use of Nabumetone may blunt the CV effects of several therapeutic agents used to treat these medical conditions [e.g., diuretics, ACE inhibitors, or angiotensin receptor blockers (ARBs)] [see Drug Interactions].Avoid the use of nabumetone tablets in patients with severe heart failure unless the benefits are expected to outweigh the risk of worsening heart failure. 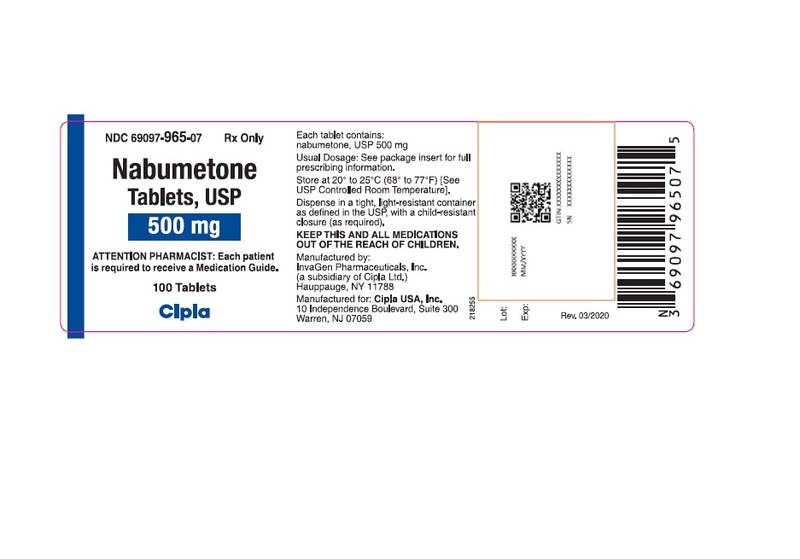 If nabumetone tablets are used in patients with severe heart failure, monitor patients for signs of worsening heart failure.Gastrointestinal Effects, Risk of Ulceration, Bleeding, and Perforation: NSAIDs, including nabumetone tablets, can cause serious gastrointestinal (GI) adverse events including inflammation, bleeding, ulceration, and perforation of the stomach, small intestine, or large intestine, which can be fatal. These serious adverse events can occur at any time, with or without warning symptoms, in patients treated with NSAIDs. Only 1 in 5 patients, who develop a serious upper GI adverse event on NSAID therapy, is symptomatic. Upper GI ulcers, gross bleeding, or perforation caused by NSAIDs occur in approximately 1% of patients treated for 3 to 6 months, and in about 2 to 4% of patients treated for 1 year. These trends continue with longer duration of use, increasing the likelihood of developing a serious GI event at some time during the course of therapy. However, even short-term therapy is not without risk.In controlled clinical trials involving 1,677 patients treated with nabumetone (1,140 followed for 1 year and 927 for 2 years), the cumulative incidence of peptic ulcers was 0.3% (95% CI; 0%, 0.6%) at 3 to 6 months, 0.5% (95% CI; 0.1%, 0.9%) at 1 year and 0.8% (95% CI; 0.3%, 1.3%) at 2 years. In patients with active peptic ulcer, physicians must weigh the benefits of therapy with nabumetone against possible hazards, institute an appropriate ulcer treatment regimen and monitor the patients’ progress carefully. NSAIDs should be prescribed with extreme caution in those with a prior history of ulcer disease or gastrointestinal bleeding. Patients with a prior history of peptic ulcer disease and/or gastrointestinal bleeding who use NSAIDs have a greater than 10-fold increased risk for developing a GI bleed compared to patients with neither of these risk factors. Other factors that increase the risk for GI bleeding in patients treated with NSAIDs include concomitant use of oral corticosteroids or anticoagulants, longer duration of NSAID therapy, smoking, use of alcohol, older age, and poor general health status. Most spontaneous reports of fatal GI events are in elderly or debilitated patients and therefore, special care should be taken in treating this population.To minimize the potential risk for an adverse GI event in patients treated with an NSAID, the lowest effective dose should be used for the shortest possible duration. Patients and physicians should remain alert for signs and symptoms of GI ulceration and bleeding during NSAID therapy and promptly initiate additional evaluation and treatment if a serious GI adverse event is suspected. This should include discontinuation of the NSAID until a serious GI adverse event is ruled out. For high risk patients, alternate therapies that do not involve NSAIDs should be considered.Renal Effects: Long-term administration of NSAIDs has resulted in renal papillary necrosis and other renal injury. Renal toxicity has also been seen in patients in whom renal prostaglandins have a compensatory role in the maintenance of renal perfusion. In these patients, administration of an NSAID results in a dose-dependent decrease in prostaglandin synthesis and, secondarily, in a reduction of renal blood flow, which may precipitate overt renal decompensation. Patients at greatest risk of this reaction are those with impaired renal function, heart failure, liver dysfunction, those taking diuretics, and the elderly. Discontinuation of NSAID therapy is usually followed by recovery to the pretreatment state.Advanced Renal Disease: No information is available from controlled clinical studies regarding the use of nabumetone tablets in patients with advanced renal disease. Therefore, treatment with nabumetone tablets is not recommended in these patients with advanced renal disease. 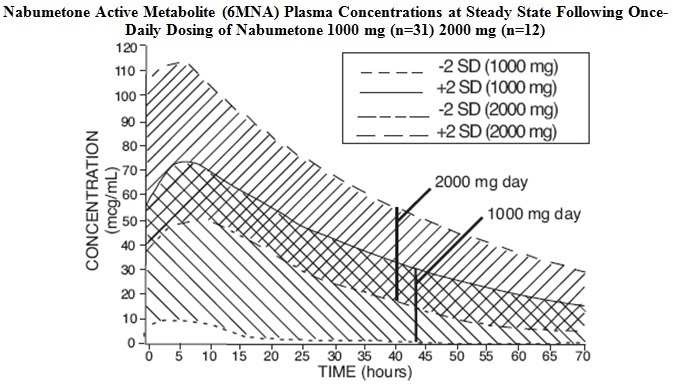 If nabumetone tablets therapy must be initiated, close monitoring of the patient’s renal function is advisable.Because nabumetone undergoes extensive hepatic metabolism, no adjustment of the dosage of nabumetone is generally necessary in patients with mild renal insufficiency; however, as with all NSAIDs, patients with impaired renal function should be monitored more closely than patients with normal renal function (see CLINICAL PHARMACOLOGY, Pharmacokinetics, Renal Insufficiency). In subjects with moderate renal impairment (creatinine clearance 30 to 49 mL/min) there is a 50% increase in unbound plasma 6MNA and dose adjustment may be warranted. The oxidized and conjugated metabolites of 6MNA are eliminated primarily by the kidneys.Anaphylactoid Reactions: As with other NSAIDs, anaphylactoid reactions may occur in patients without known prior exposure to nabumetone tablets. Nabumetone tablets should not be given to patients with the aspirin triad. This symptom complex typically occurs in asthmatic patients who experience rhinitis with or without nasal polyps, or who exhibit severe, potentially fatal bronchospasm after taking aspirin or other NSAIDs (see CONTRAINDICATIONS and PRECAUTIONS, General, Preexisting Asthma). Emergency help should be sought in cases where an anaphylactoid reaction occurs.Skin Reactions: NSAIDs, including nabumetone tablets, can cause serious skin adverse events such as exfoliative dermatitis, Stevens-Johnson Syndrome (SJS), and toxic epidermal necrolysis (TEN), which can be fatal. These serious events may occur without warning. Patients should be informed about the signs and symptoms of serious skin manifestations and use of the drug should be discontinued at the first appearance of skin rash or any other sign of hypersensitivity. Pregnancy: In late pregnancy, as with other NSAIDs, nabumetone tablets should be avoided because it may cause premature closure of the ductus arteriosus. General: Nabumetone tablets cannot be expected to substitute for corticosteroids or to treat corticosteroid insufficiency. Abrupt discontinuation of corticosteroids may lead to disease exacerbation. Patients on prolonged corticosteroid therapy should have their therapy tapered slowly if a decision is made to discontinue corticosteroids.The pharmacological activity of nabumetone tablets in reducing fever and inflammation may diminish the utility of these diagnostic signs in detecting complications of presumed noninfectious, painful conditions.Hepatic Effects: Borderline elevations of 1 or more liver function tests may occur in up to 15% of patients taking NSAIDs including nabumetone tablets. These laboratory abnormalities may progress, may remain unchanged, or may be transient with continuing therapy. Notable elevations of ALT or AST (approximately 3 or more times the upper limit of normal) have been reported in approximately 1% of patients in clinical trials with NSAIDs. In addition, rare cases of severe hepatic reactions, including jaundice and fatal fulminant hepatitis, liver necrosis and hepatic failure, some of them with fatal outcomes have been reported. A patient with symptoms and/or signs suggesting liver dysfunction, or in whom an abnormal liver test has occurred, should be evaluated for evidence of the development of a more severe hepatic reaction while on therapy with nabumetone tablets. If clinical signs and symptoms consistent with liver disease develop, or if systemic manifestations occur (e.g., eosinophilia, rash, etc. ), nabumetone tablets should be discontinued.Hematological Effects: Anemia is sometimes seen in patients receiving NSAIDS, including nabumetone tablets. This may be due to fluid retention, occult or gross GI blood loss, or an incompletely described effect upon erythropoiesis. Patients on long-term treatment with NSAIDs, including nabumetone tablets, should have their hemoglobin or hematocrit checked if they exhibit any signs or symptoms of anemia. NSAIDs inhibit platelet aggregation and have been shown to prolong bleeding time in some patients. Unlike aspirin, their effect on platelet function is quantitatively less, of shorter duration, and reversible. 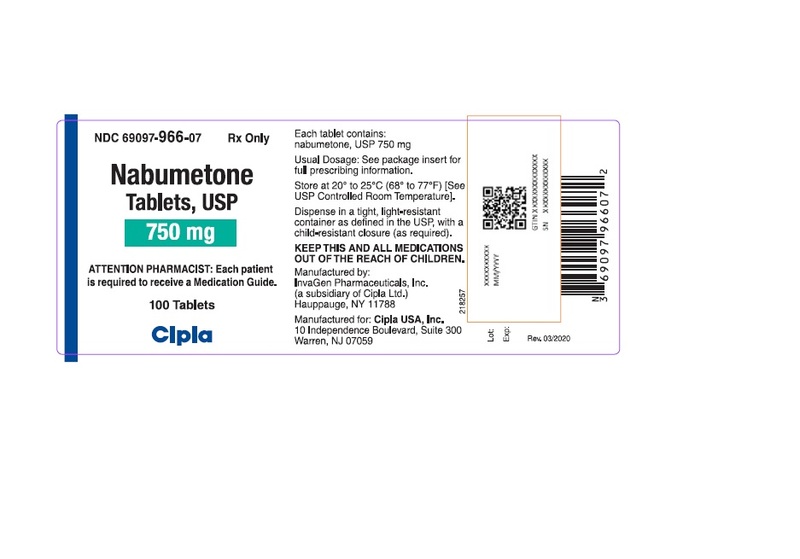 Patients receiving nabumetone tablets who may be adversely affected by alterations in platelet function, such as those with coagulation disorders or patients receiving anticoagulants, should be carefully monitored (see CLINICAL PHARMACOLOGY, Special Studies, Other).Preexisting Asthma: Patients with asthma may have aspirin-sensitive asthma. The use of aspirin in patients with aspirin-sensitive asthma has been associated with severe bronchospasm which can be fatal. Since cross reactivity, including bronchospasm, between aspirin and other non-steroidal anti-inflammatory drugs has been reported in such aspirin-sensitive patients, nabumetone tablets should not be administered to patients with this form of aspirin sensitivity and should be used with caution in patients with preexisting asthma.Photosensitivity: Based on ultraviolet (U.V.) light photosensitivity testing, nabumetone may be associated with more reactions to sun exposure than might be expected based on skin tanning types. Information for Patients: Patients should be informed of the following information before initiating therapy with an NSAID and periodically during the course of ongoing therapy. Patients should also be encouraged to read the NSAID Medication Guide that accompanies each prescription dispensed.Cardiovascular Thrombotic Events Advise patients to be alert for the symptoms of cardiovascular thrombotic events, including chest pain, shortness of breath, weakness, or slurring of speech, and to report any of these symptoms to their health care provider immediately [see WARNINGS].Nabumetone tablets, like other NSAIDs, can cause GI discomfort and, rarely, serious GI side effects, such as ulcers and bleeding, which may result in hospitalization and even death. Although serious GI tract ulcerations and bleeding can occur without warning symptoms, patients should be alert for the signs and symptoms of ulcerations and bleeding, and should ask for medical advice when observing any indicative sign or symptoms including epigastric pain, dyspepsia, melena, and hematemesis. Patients should be apprised of the importance of this follow-up (see WARNINGS, Gastrointestinal Effects, Risk of Ulceration, Bleeding, and Perforation).Nabumetone tablets, like other NSAIDs, can cause serious skin side effects such as exfoliative dermatitis, SJS, and TEN, which may result in hospitalizations and even death. Although serious skin reactions may occur without warning, patients should be alert for the signs and symptoms of skin rash and blisters, fever, or other signs of hypersensitivity such as itching, and should ask for medical advice when observing any indicative signs or symptoms. Patient should be advised to stop the drug immediately if they develop any type of rash and contact their physicians as soon as possible.Heart Failure And Edema Advise patients to be alert for the symptoms of congestive heart failure including shortness of breath, unexplained weight gain, or edema and to contact their healthcare provider if such symptoms occur [see WARNINGS].Patients should be informed of the warning signs and symptoms of hepatotoxicity (e.g., nausea, fatigue, lethargy, pruritus, jaundice, right upper quadrant tenderness, and “flu-like” symptoms). If these occur, patients should be instructed to stop therapy and seek immediate medical therapy. Patients should be informed of the signs of an anaphylactoid reaction (e.g. difficulty breathing, swelling of the face or throat). If these occur, patients should be instructed to seek immediate emergency help (see WARNINGS). In late pregnancy, as with other NSAIDs, nabumetone tablets should be avoided because they may cause premature closure of the ductus arteriosus. Laboratory Tests: Because serious G.I. tract ulceration and bleeding can occur without warning symptoms, physicians should monitor for signs and symptoms of GI bleeding. Patients on long-term treatment with NSAIDs, should have their CBC and a chemistry profile checked periodically. If clinical signs and symptoms consistent with liver or renal disease develop, systemic manifestations occur (e.g., eosinophilia, rash, etc.) or if abnormal liver tests persist or worsen, nabumetone tablets should be discontinued. Nonteratogenic Effects: Because of the known effects of non-steroidal antiinflammatory drugs on the fetal cardiovascular system (closure of ductus arteriosus), use during pregnancy (particularly late pregnancy) should be avoided. Labor and Delivery: In rat studies with NSAIDs, as with other drugs known to inhibit prostaglandin synthesis, an increased incidence of dystocia, delayed parturition, and decreased pup survival occurred. The effects of nabumetone tablets on labor and delivery in pregnant women are unknown. Nursing Mothers: It is not known whether this drug is excreted in human milk, however 6MNA is excreted in the milk of lactating rats. Because many drugs are excreted in human milk and because of the potential for serious adverse reactions in nursing infants from nabumetone, a decision should be made whether to discontinue nursing or to discontinue the drug, taking into account the importance of the drug to the mother. Geriatric Use: As with any NSAIDs, caution should be exercised in treating the elderly (65 years and older). Of the 1,677 patients in US clinical studies who were treated with nabumetone, 411 patients (24%) were 65 years or older; 22 patients (1%) were 75 years or older. No overall differences in efficacy or safety were observed between these older patients and younger ones. Similar results were observed in a 1-year, non-US postmarketing surveillance study of 10,800 patients treated with nabumetone, of whom 4,577 patients (42%) were 65 years or older. ———————————————————————————––––––––––––† Adverse reactions reported only in worldwide postmarketing experience or in the literature, not seen in clinical trials, are considered rarer and are italicized.Incidence < 1% — Causal Relationship UnknownGastrointestinal: Bilirubinuria, duodenitis, eructation, gallstones, gingivitis, glossitis, pancreatitis, rectal bleeding.Central Nervous System: Nightmares.Dermatologic: Acne, alopecia.Cardiovascular: Angina, arrhythmia, hypertension, myocardial infarction, palpitations, syncope, thrombophlebitis.Respiratory: Asthma, cough.Genitourinary: Dysuria, hematuria, impotence, renal stones.Special Senses: Taste disorder.Body as a Whole: Fever, chills.Hematologic/Lymphatic: Anemia, leukopenia, granulocytopenia.Metabolic/Nutritional: Hyperglycemia, hypokalemia, weight loss. Symptoms following acute NSAIDs overdoses are usually limited to lethargy, drowsiness, nausea, vomiting, and epigastric pain, which are generally reversible with supportive care. Gastrointestinal bleeding can occur. Hypertension, acute renal failure, respiratory depression, and coma may occur, but are rare. Anaphylactoid reactions have been reported with therapeutic ingestion of NSAIDs, and may occur following an overdose.Patients should be managed by symptomatic and supportive care following a NSAIDs overdose. There are no specific antidotes. Emesis and/or activated charcoal (60 to 100 grams in adults, 1 to 2 g/kg in children), and/or osmotic cathartic may be indicated in patients seen within 4 hours of ingestion with symptoms or following a large overdose (5 to 10 times the usual dose). Forced diuresis, alkalinization of urine, hemodialysis, or hemoperfusion may not be useful due to high protein binding.There have been overdoses of up to 25 grams of nabumetone reported with no longterm sequelae following standard emergency treatment (i.e., activated charcoal, gastric lavage, IV H2-blockers, etc.). Carefully consider the potential benefits and risks of nabumetone tablets and other treatment options before deciding to use nabumetone. Use the lowest effective dose for the shortest duration consistent with individual patient treatment goals (see WARNINGS).After observing the response to initial therapy with nabumetone tablets, the dose and frequency should be adjusted to suit an individual patient’s needs.Osteoarthritis and Rheumatoid Arthritis: The recommended starting dose is 1,000 mg taken as a single dose with or without food. Some patients may obtain more symptomatic relief from 1,500 mg to 2,000 mg per day. Nabumetone tablets can be given in either a single or twice-daily dose. Dosages greater than 2,000 mg per day have not been studied. The lowest effective dose should be used for chronic treatment (see WARNINGS, Renal Effects). Patients weighing under 50 kg may be less likely to require dosages beyond 1,000 mg; therefore, after observing the response to initial therapy, the dose should be adjusted to meet individual patients’ requirements.